Celebrate General George Washington's Birthday With Us! Did you know that the first public celebration of Washington's birthday was at Valley Forge in 1778? Join General Washington, Mrs. Washington, members of the Continental Army, and others to celebrate the General's 286th birthday this President's Day. Cupcakes and samples of Martha Washington's "Great Cake" recipe will be available for the public courtesy of Montgomery County Community College's Culinary Arts program. Birthday Activities in the Visitor Center | 10:00 a.m. - 12:00 p.m.
Children and adults can try on 18th century clothing and meet the General and Mrs. Washington, played by historical interpreters John Lopes and Carol Spacht. Stop at the enlistment table to sign up for the Join the Continental Army program, which will take place at 12:45 p.m. after the cake ceremony. 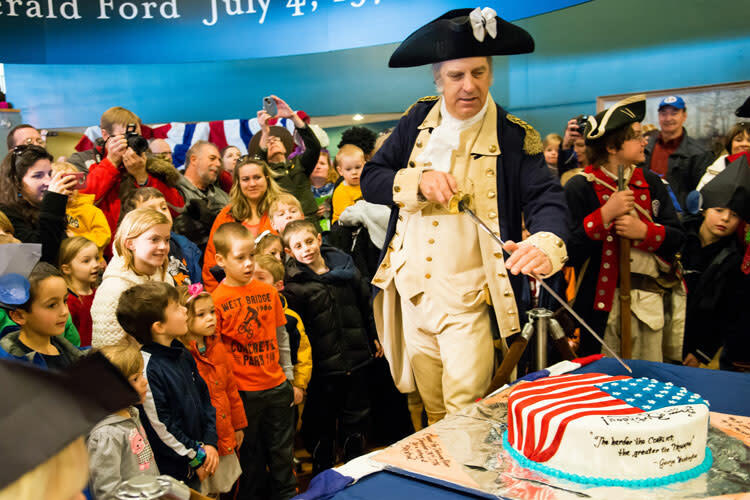 Sing Happy Birthday to General Washington | 12:00 p.m.
Help Martha sing Happy Birthday to George Washington as he cuts his cake. Cupcakes and samples of Martha Washington's birthday cake recipe will be served outside. Colonial Music and Storytelling | 10:00 a.m. - 2:00 p.m. Listen to live music from the Colonial Revelers (until noon) and hear exciting stories of the American Revolution from the professional storytellers of Historic Philadelphia Inc. Located in the Theater. Crafts in the Meeting Room (formerly the Education Center) | 10:00 a.m. - 12:00 p.m.
Get ready to meet our nation's first president. 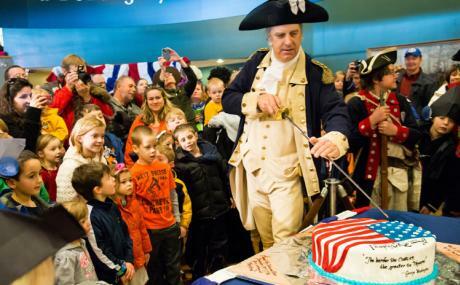 Create a birthday card for General Washington and make your own matching tricorn hat. Join the Continental Army | 12:45 p.m.
Children will fall in to drill formation and be taught how to march and drill like a Continental Soldier on the new mini grand parade, just outside of the upper Visitor Center doors. Troops will receive a special instruction from General Washington! Make sure to enlist (register) at the Visitor Center between 10 a.m. and 12 p.m.
Visit the Visitor Center Front Desk and speak to a ranger about becoming an official National Park Service Junior Ranger. 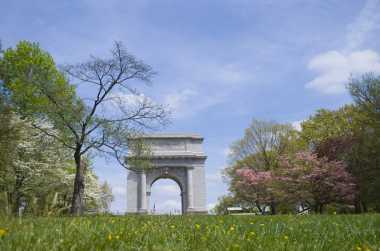 Don't forget to visit Washington's Headquarters and the Muhlenberg Brigade Huts, open from 10:00 a.m. to 4:00 p.m.